Ok, so my desktop is finished! Well, mostly! I worked all weekend to get it sanded, stained, and sealed. Hubby helped me install it tonight. Good thing we're not moving any time soon. This will be a beast to get out! See all that workspace? I'm giddy! Ok I'm getting envious over here with all the craft room and work spaces that I'm seeing all around. Secretly I'm trying to get my daughter off to college (for her education of course) but also so I can make her room my craft room. haha Love your desk! great workspace! you'll be creatin' up a storm in there! THE DESK LOOKS TERIFFIC. ITS ALWAYS NICE TO HAVE EVERYTHING SET UP WHERE YOU NEED IT. aaah! i love it!!!! what a change to that room- looks awesome! I featured your thread holder on my blog today. feel free to check it out and grab a featured button if you'd like! Loved the project! totally jealous! 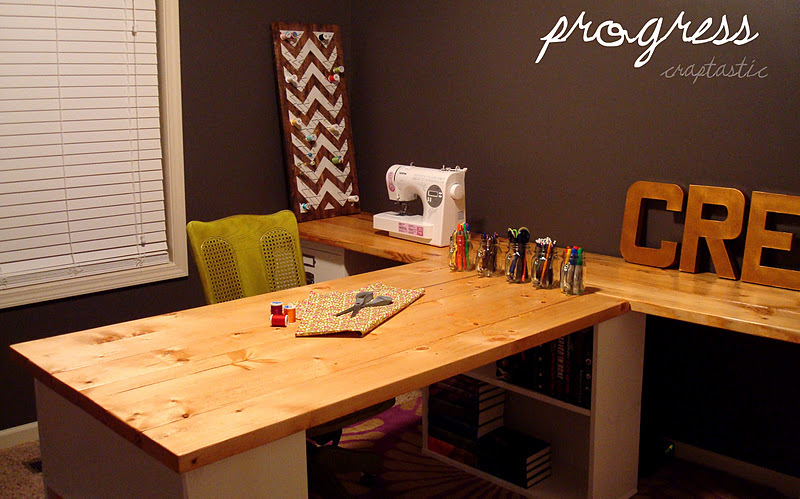 i wish i had a craft room, ah, how would that be?! love it. very cool. i love how much space you got out of it. your office is turning out great! awesome desk! I'm happily your newest follower! I love it, where did you buy the bookcases? Lots of space for creativity there!! Have fun! I've meant to say for days...What a great space. Such a nice spot to have lots of creative time. Whooo! Lookin' good! That's a nice solid wordspace you've got there.